Staying with the "L" theme (last year he was a lion of course) but holding to more local wildlife, Liam was a lobster this year. Here he is discussing his excitement with his fellow crustacean Claude the Crab. Halloween is strange for us. Liam doesn't eat candy and while he humors his mother and I by tolerating the costumes, he'd rather we allow him to just hang out in his jammies. We take pictures and celebrate the best we can without the whole trick-or-treating thing. This year Liam helped give out treats with his mom until dad came home from work. We had the most trick-or-treaters we've ever had at this house — two. I think it's the 18 feet of aluminum handicapped ramp out front that throws them off. *Who's Got The Melted Butter? You crack me up. And Liam, well, that costume is just amazing. We made up for your lack of trick or treaters …. we had, I kid you not, like 300 plus, trick or treaters. Next year we are going to get a click counter to get an accurate number. Crazy times in this neighborhood. 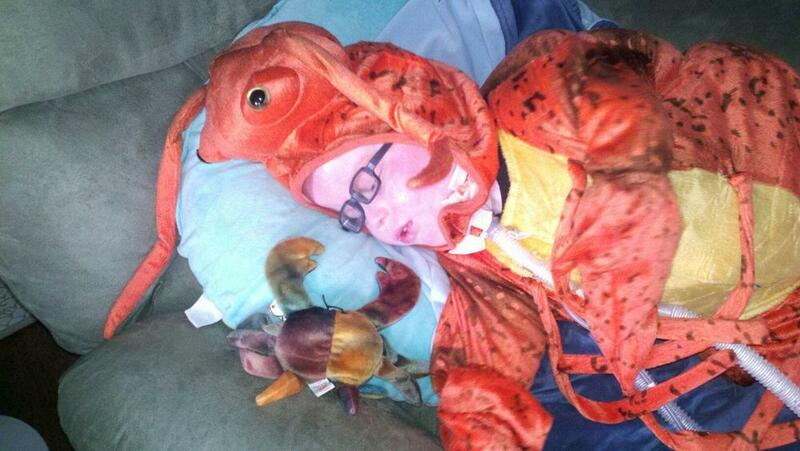 I recognize Claude the Crab … a Beanie Baby, right? I will not even tell you how many bags of those stuffed little things I have. Bags. Plural. My girls went nuts for them when they were younger and I, was wacky enough to go along with it. I literally get sick multiplying how much each cost, by how many we have. Wish I could get that cash back. Although there are some super cute ones. Sorry I write you novels by the way. You should never apologize for your comments, no matter how long. Claude most definitely is a beanie baby. He was a gift from karin and I to Liam a few days into his most recent hospital stay. We like to get him a new stuffed animal from the hospital gift shop every time we visit there. He’s getting quite the collection of Hasbro Children’s Hospital friends.